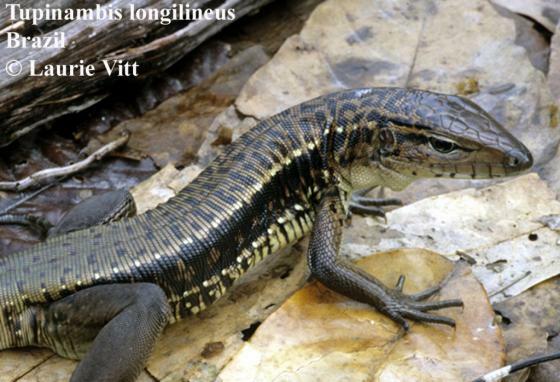 Can you confirm these amateur observations of Tupinambis longilineus? Type locality: Alvorado d'Oeste (road BR-429, km 87, line 64), Rondonia, Brazil. Diagnosis Diagnosis: Tupinambis longilineus differs from T. merianae, T. rufescens, and from T. duseni by the presence of only one loreal scale (two loreals in the latter three species); supraciliaries in direct contact with supraoculars (second to fourth separated from the supraciliaries by a row of scales); presence of a supernumerary antegular fold; and smaller number of ventrals across midbody (20 in T. longilineus, 30-40 in T. merianae, 46-50 in T. rufescens, and 46 in T. duseni). In all these characteristics, T. longilineus is closer to T. teguixin. These two species differ from T. merianae in having distinctly large supra-temporals, lower number of pores and gular region spotless or with small, black or grey spots. 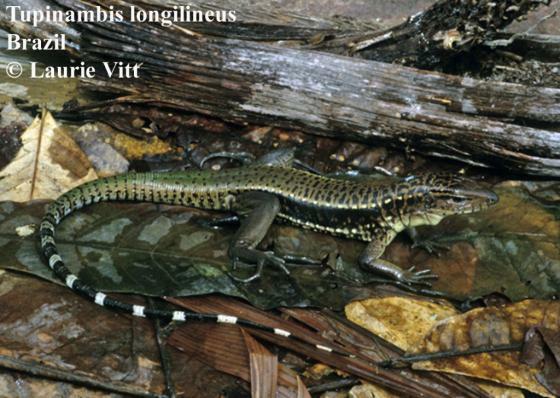 Tupinambis longilineus differs from T. teguixin by its slender body and limbs, with body compressed and rectangular in cross section (cylindrical in T. teguixin), temporal scales comparatively larger, higher number of femoral pores; slightly lower numbers of dorsal scales around midbody and ventrals across midbody, and lower number of subdigital lamellae, especially under fourth finger (Ávila-Pires 1995). Comment Apparently sympatric with T. teguixin. Probably also in Bolivia (fide LANGSTROTH 2005). Distribution: see map in Silva et al. 2018.